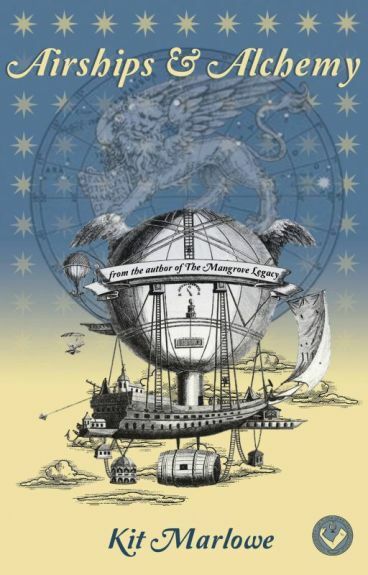 Guest Blog - Author Kit Marlowe on "Airships and Alchemy"
From the author of the comic Gothic novel The Mangrove Legacy and the medieval Breton Lais series, Airships & Alchemy brings you magic, mayhem, mechanicals — and beasts of various sizes! Airships are nothing new in steampunk, but in my latest novel I tried to add a slightly more surprising angle. I imagined a world in which alchemy was not dropped in favour of chemistry alone, but continued to develop as the primary science. No longer simply in search of the philosopher’s stone, alchemists in my alternate history work on mundane tasks as well deeper occult secrets. They bring their mystical expertise to practical problems—like providing interesting fuels for airships. Attitudes from the past linger: Helen’s father always refers disparagingly to the alchemist with whom his daughter plans to work, often calling him a mountebank. As far back as Chaucer’s time, this image of alchemists as frauds seemed to be the norm. The poet’s Canon’s Yeoman’s Tale offers up a portrait of the alchemist as con man, passing off recipes for gold that required nothing more than sleight of hand tricks. Alessandro Maggiormente, the alchemist in my novel, is most notable for his proclivity for explosions (although to be fair, most of them are fairly small) and for his familiar, a Venetian lion named Eduardo. Because he is so accustomed to the beast, Maggiormente seldom notices the stares his familiar causes. Of course, so deeply absorbed in his work, it might be more accurate to say he notices very little that doesn’t have something to do with his alchemy. Eduardo, however, is very hard to overlook. Imagine: a large lion would always stand out in Paris. It is not their natural location. But a Venetian lion is something extraordinary beyond a mere lion, too, for it has a pair of wings that are prone to draw gasps of amazement even after the initial reaction to finding the king of beasts prowling the Parisian pavement. While mostly ornamental—being far too small to actually cause the lion to fly, a fact Eduardo is generally loathe to admit—the idea of an airborne lion unsettles even the most hardened denizen of the City of Lights. The addition on many occasions of a jaunty fez to the lion’s head might undercut somewhat any sense of alarm, even if it is also likely to leave many confused. Surely Parisians would appreciate his sense of style. In the novel, many people are initially frightened by the sight of Eduardo, but when they realise his nature is mostly gentle (provided one is not a pigeon, a creature for which he has no tolerance) they are inclined to accept him as they do much smaller cats. “We don’t have to move,” the lion said, looking a little too pleased with himself. He stretched his wings out to their full size and then folded them back down again. The alchemist had a momentary image of the lion eating the poor woman, but doubtless he would be lying down to digest a meal of that size and he was looking far too alert and pleased with himself for that—which was a relief to say the least. He was not pleased with Mme. Gabor, but he would not wish her to become Eduardo’s supper. “I reasoned with her.” The lion looked even more smug now, shaking his mane to emphasize his pronouncement. “Only as an example,” Eduardo said with a small growl. “What? She was trouble—and it was only likely to get worse. You need to work. I need to eat. It’s a fairly simple equation.” The lion coughed and a couple of pigeon feathers wafted out of his mouth onto the floor. Visit Kit Marlowe’s website http://kit-marlowe.com or find her on Facebook. Buy Airships & Alchemy on Kindle or as a paperback. Guest Blog - Author Abra Staffin-Wiebe on "The Circus of Brass and Bone"
Gender Balance Made Easy - Add an Apocalypse and Stir! Thank you, Catherine, for inviting me to talk about my post-apocalyptic steampunk novel, A Circus of Brass and Bone (Amazon). A Circus of Brass and Bone began life as a serial story that I wrote as a medical fundraiser. This led to several unique challenges. The one that I'm going to talk about today is how inconveniently generous women are. One of the rewards I offered for supporters was to have a character named after them. In the beginning, this was well and good. When a new character appeared, I would choose a name of the appropriate gender from the donor list and keep going. Because the book focuses on a circus traveling through the collapse of civilization and the challenges they must overcome in each new city, there were plenty of new characters. Then the female names from supporters began to pile up. Now, for context, you need to know that I laugh and point every time I encounter a book or a TV show that falls prey to the Smurfette fallacy. My favorite movies usually pass the Bechdel test with flying colors (and flying kicks!). I'm a female science fiction writer. I thought I had this stuff down. The circus members were fine. From the conjoined sisters to the skeleton man, the girl sharpshooter to the snake oil salesman, the gender balance came out about even. They were important characters, after all. I'd spent some thought on balancing their motivations, personality quirks, abilities, and, yes, genders. Minor characters didn't matter as much, right? After all, they were spear carriers. If they did their job, whether they had girl bits or boy bits was irrelevant. It wouldn't really affect the story. But now I had all these extra female names. I started having to stop and question why I'd assigned a particular gender to a bit character and if I could do it differently. A Circus of Brass and Bone is set in a slightly alternate version of the United States not long after the War Between the States, which complicated things. Restricted gender roles! Historical verisimilitude! Fortunately, the book has an apocalypse. After an aetheric chain reaction wipes out a third of the population, many things change. All sorts of people step up to do what needs doing. The way they do it is of course strongly influenced by their previous roles in life. And that, gentlepersons, is why some of the most interesting stories happen during or after a disruptive event. Some characters' genders were still locked in by their historical role, but not as many as I'd initially thought. Avoiding the default spear carrier minor characters changed the story more than I'd expected, and for the better. The scene excerpted below would not have existed without those changes. From what I've described, you might be imagining a heavily female-weighted book. Not so. Even though it felt strange writing so many women in minor roles, the kicker is that I ended up with a cast of characters that was pretty much equally balanced. I have to wonder how many stories that feel "naturally" gender-balanced to their writers and readers are nothing of the kind. What I learned is that gender balance requires active thought about even minor characters, especially in historical settings. And when in doubt, add an apocalypse! Mrs. Della Rocca opened her door wearing an apron lightly dusted with flour. The aroma of biscuits drifted out to greet them. “Welcome!” she said. “You must be new to town!” She tossed a questioning glance in the storekeeper’s direction. Obediently, Christopher picked up his biscuit and bit in. The biscuit was hot and fluffy on the inside, but he noticed a slight bitter aftertaste he didn’t like. Too much baking soda in the recipe, perhaps. Not wanting to alienate his host, however, he finished the biscuit, smiled, took a sip of tea—and slid sideways as the world tilted and darkened around him. He barely felt the impact when he hit the floor. Christopher Knall straightened from his labor in the chicory field, pressed his hand to the small of his back, and leaned into a stretch. Dried sweat made his shirt crackle under his hand. Mud coated his pants. He was hardly the fine sight he’d been when he walked into town with a suitcase full of ladies’ hair combs and men’s shaving sets to sell. Something moved along the road in the distance. He squinted. Wagons, traveling their way. Poor bastards don’t know what they’re getting into. Can I warn them somehow? When the caravan got closer, the thought vanished. He gaped. It must be a hallucination. He’d finally cracked. The procession was led by a woman standing on top of her saddle as if that was a perfectly ordinary way to ride a horse. A freakishly thin and elongated man rode in one of the wagons behind her. A pair of miniature humans perched atop another. And the giant bone and brass thing that flanked them could only have ridden out of a nightmare. Continued in A Circus of Brass and Bone. "Read if: You would love to read about circus freaks, espionage, war elephant golems, intrepid female ship captains, monkeys finding true love, and the authentic smells of large cities." "the world has a texture and a past that appeals even as it appalls ... The characters have a lot of bad stuff happening to them, but they retain both agency and their moral sense. The darker scenes never devolve into hopelessness or pointless gore." "'Circus' is a steampunk fantasy piece told in a period voice. It has a thick Dickensian accent and the affectations of Christie, Shelley and Austen. It's sparking conversations you'd expect at a dinner party where Katherine Dunn, Cormac McCarthy and Kurt Vonnegut had a little too much wine. It's imaginative modern literature." Movies: "The Extraordinary Adventures of Adele Blanc-Seq"
This is a French steampunk-infleunced film set in 1910 by Luc Besson, from 2010 but now available in DVD. Adele has a badly injured sister, a friend with a pterodactyl, a mummy and a lot of attitude. Needless to say, I like most things about Adele. The movie is weirdly fabulous in most respects, replete with oddball characters, dinosaurs, talking mummies, amazing sets (I particularly like the gearwork mummy embalming engine) and the general stuff of pulp fiction. I had a few cringes over the colonialist stuff from the first part of the film, when she's in Egypt, and during the section where she blames herself for her sister's entirely accidental injury, but apart from that, this was just plain fun and like almost everyone else who's seen it, I want a sequel to its cliff-hanger ending. I met Rachael while working at the SFWA table at the 2012 Chicago Worldcon and have been enjoying her company on social media ever since. She's working on a series of 5 steampunk novellas for Musa Publishing which feature a bisexual Latina protagonist and her male sidekick. I've just started reading these and am looking forward to enjoying them all. She's also very interesting and you should follow her on Twitter at @katsudonburi. And, of course, buy her books! Welcome, Rachael! Sherlock Holmes is always a white guy. To be fair, that’s how he was written over one hundred years ago, by someone who was also a white guy. White guys, as one might expect, have a long and glorious history in Western literature as both writer and subject. They’re everywhere. And there’s nothing necessarily wrong with that (hey, some of my best friends are white guys!) but I don’t think I’m alone in thirsting for a deeper taste of the glorious rainbow that is human existence. Does Sherlock Holmes always have to be a white guy? Consider another hallowed canon of Western: all of the great Shakespearean heroes were white guys (with the sole exception of Othello, who was normally until modern times played by a white guy in makeup) as well. But that’s beginning to change. In Kenneth Branagh's Much Ado About Nothing, Don Pedro was played by Denzel Washington. In the recent BBC production of Richard II, the Bishop of Carlisle was played by Lucian Msamati (who has played Pericles on stage, by the way). Roles traditionally played by white actors have been played just fine by those of other races, and the world hasn't ended. What about male roles played by women? Well, in Joss Whedon's new Much Ado About Nothing, Conrade was played by Riki Lindhome. It can be done, and I hope more and more major roles will see that willingness to bend gender. It's not Shakespeare's fault he lived in a time where they thought only white guys had adventures and stories worth telling. Perhaps theater has the advantage because every production is unique; every time a play is staged, it’s a new opportunity to tell the story from a different perspective, in a different tone, and let it be born anew. Which brings us back to Sherlock Holmes. It’s beloved literature, but not so hallowed as Shakespeare. If Shakespeare can bend into something fresh and new without breaking, why not this as well? And the proof: the television series Elementary, with John Watson turned to Joan Watson and played wonderfully by Lucy Liu. (And Moriarty is a woman as well!) While in some quarters of the internet you'd think the world was about to come to an end, the series is clever, interesting, and has been renewed for a second season. In less enlightened times (or, sadly, in modern day in some dark, terrifying recesses of the internet) perhaps people would have argued that the qualities that made Holmes great as a detective were the purview of white men--intellect, logic, cool rationality. But we know that's not the case. I think what keeps Sherlock Holmes a white guy is the same thing that made some people complain when the Bishop of Carlisle was black--the sheer weight of tradition. But art is supposed to be a living, changing thing. We can appreciate the historical context, but it should also reflect something about who we are today. And we're finally at a today where Don Pedro can be black, where Conrade can be a woman, and where John Watson can be an Asian-American woman. Some people might not like it, but we're doing it anyway and giving beloved stories new life. So why not? Why not reimagine Sherlock Holmes a woman? I’ve never been the sort to stop just as that though, and I ran wild with the idea. Captain Ramos isn’t a faithful copy of Holmes, but rather a reimagining of the Great Detective written from my own more modern frame of reference and placed in a steampunk universe full of adventure and intrigue. Captain Ramos is first and foremost, a creature of intellect and logic, fueled by observation, quite similar (I hope) to Sherlock Holmes. I was tired of female investigators (successful as they are) being so often set up with intuition as their primary weapon, as if logic is something only men can do. I’d recently become fascinated by the punk bit of steampunk; a pirate captain is in a good position to be anti-authoritarian and non-conformist. Perhaps in my own small moment of punk, I wrote the Captain to challenge the established stereotypes from movies and books that I've come to loathe. The decision to make her Latina (as far as such an identity goes in the strange, alternate America in which she lives) was a subconscious one, I think a contrarian reaction to Latinas being so often stereotyped as "fiery." While there's a lot of life to the good Captain, a lot of humor and even passion, beneath it all she's cool and calculating ice. I gave her a male sidekick that she would never in a million years have any sort of romantic or sexual interest in because I was so tired of hearing that men and women "can't be friends" and similar nonsense. And I made her part of the LGBTQ family because, well, damnit I'm a bisexual woman and I want to see more bisexual characters. It’s the 21st century; high time for a glorious rainbow of Great Detectives. There are currently three ebook novellas out about Captain Ramos: Murder on the Titania, The Ugly Tin Orrery, and The Curious Case of Miss Clementine Nimowitz (and Her Exceedingly Tiny Dog), with two more set to come out this year from Musa Publishing. I hope you'll have even more fun reading them than I had writing them! All of these books can be found nearly wherever ebooks are sold, but here are the links for direct purchase from Musa! And the link to the rest of the most promising review. Queer Steampunk ghost and horror story acceptance! My lesbian steampunk ghost story "Medium Méchanique" has been accepted for the queer steampunk book Ghosts in Gaslight, Monsters in Steam: Gay City Anthology 5, to be published by Minor Arcana Press & the Gay City Health Project. It's scheduled to be out in July and will include fiction, art, poetry and general. There's a Kickstarter to help pay for upfront costs to please help spread the word and donate if you can.